Sovereign Trail information. Download a map and plan your dirt bike ride in Moab. Sovereign Trail is a pretty cool dirt bike trail. It was made for single track riders only. This trail is super fun and one you have to take on before you leave Moab. There are several DIRECTIONAL trails. In other words you can only go one direction. The reason for this is usually the terrain is pretty steep. You don't want to destroy a good trail by hill climbing it. The trails are well marked and will let you know if you are going the wrong way. Sovereign trail is full of tight switch backs and the terrain is quite rocky. Directions: 11 miles North of Moab is gas station on the East side of the road. There is a nice parking area behind the gas station where you can park and unload. The trail starts there. Want to make dirt bike riding at night as much fun as mid day? 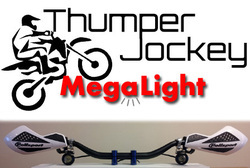 Our favorite light is the Thumper Jockey MegaLight. It's small, brighter than most stock headlights and consumes half the power. Thumper Jockey makes some of the best off road LED lights for motorcycles. Dirt bike lighting is available for motocross bikes too.